Some of our team visited the Sir Jonathan North Community College is an all-girls school in Leicester to talk about reading books. Both Sandra Pollock and Nirmala Bhojani from our Inspiring You team are authors and were able to share their experience and motivation on books and writing. 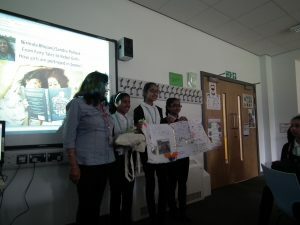 The talk focused on how girls are portrayed in books and encouraging the 11 - 16 year olds young women attending to create their own stories and female protagonist. Click on the photo below to see the photos of the visit.